- All photos by Jim Mason Chase county, Kansas is the setting of William Least Heat Moon's best selling book Prairy Erth. The county seat is Cottonwood Falls, site of a beautiful French Renaissance style courthouse built in 1873. A mile north is the rodeo town of Strong City. Two miles north of Strong City on K-177 is the 10,894-acre Tallgrass Prairie National Preserve. First established in the late 1870's as the Spring Hill Ranch by a Texas cattle baron named Stephen Jones, it was known more recently as the Z Bar Ranch. It was purchased by the National Park Trust in 1994. 180 acres were set aside by Congress in 1996 as the Tallgrass Prairie National Preserve. 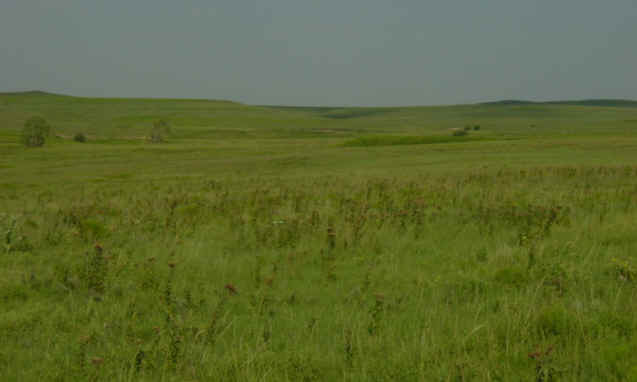 The TPNP is managed by the National Park Service to preserve, protect, and interpret the ranch home site and the surrounding tallgrass prairie rangeland. The property was designated as a National Historic Landmark in 1997. On February 17, 2005 the Kansas Park Trust purchased that part of the property owned by the National Park Trust and then conveyed it to The Nature Conservancy in April of 2005. 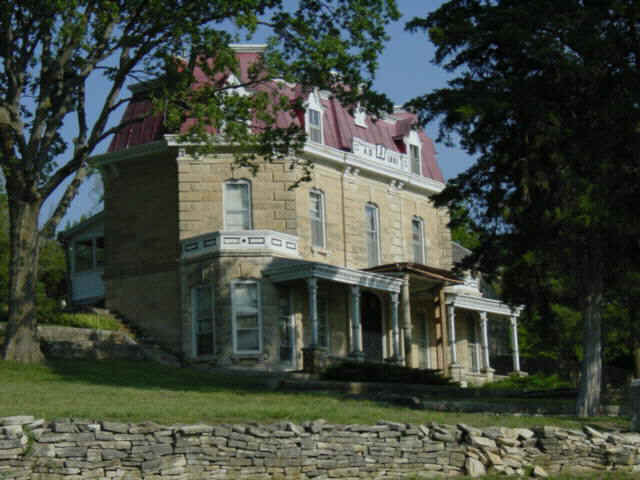 On a bluff overlooking Fox Creek Valley is the stately Second Empire style ranch house, built in 1881 of native stone - with a huge stone barn and stone outbuildings. Interpretive tours of the house are available as staffing permits. The house and barn are otherwise open for self-guided tours during regular hours, 9 - 4:30. 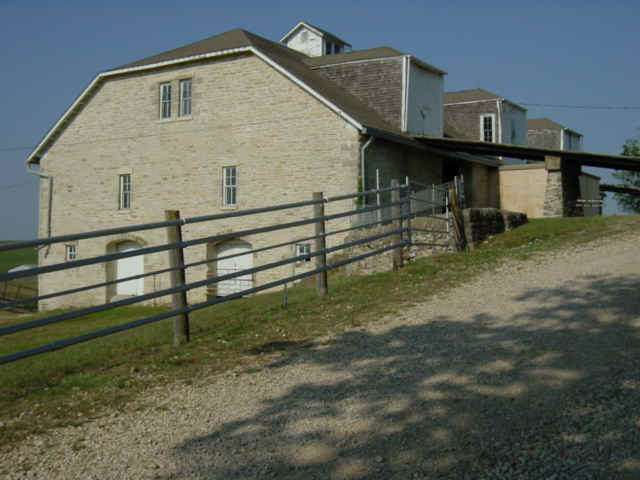 The massive stone barn has ground-level entrances on each of its three stories! Within are many historic artifacts and displays telling the early days of the ranch. A short orientation video can be viewed here as well. A delightful nature trail, starting in front of the ranch house, meanders north through creekside woodland then upward via tallgrass prairie to a ridgetop vista of the ranch. 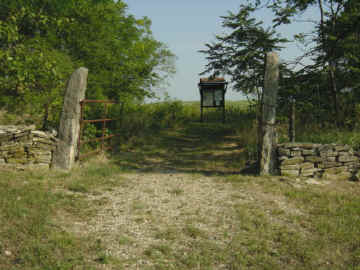 Begin your hike by strolling through this old gate in the fieldstone fence. Pick up a brochure at the driveway kiosk. If you want to see the interior of the property, park staff conduct 7-mile long bus tours through the vast grasslands of the ranch three times daily from the last Saturday in April through the last Sunday in October. The tour lasts about 1 hour and 30 minutes and are free. The tour stops on the high point of the ranch, where one can see the Flint Hills stretching to the horizon in all directions like massive waves at sea. The wind whispering through the bluestem completes the feeling of being on an "ocean of grass", as it was often described by pioneers. Managed fires sustain this tallgrass prairie of switchgrass, Indian grass, little bluestem and big bluestem which provides sustenance for the cattle that still roam the range from late spring through mid-summer. Assorted hues of prairie wildflowers appear and disappear throughout the growing season, in the ever-changing prairie panorama. Big bluestem and Indian grass may reach heights of 8 feet or more in September on the lower slopes. Greater prairie chicken, upland sandpiper, eastern meadowlark, dickcissel, grasshopper sparrow, common poorwill, common nighthawk, red-tailed hawk, northern harrier and American kestrel are just a few of the avian representatives of the prairie who will greet you here. A new visitor center is presently under construction. Restrooms are available. Scenic Overlook Trail (6.4 miles round-trip): This trail follows the bus tour route (improved ranch road) to the scenic overlook area. Along the trail, visitors will see limestone outcroppings, one of 26 human-made ponds on the preserve, remnants of stone fences, and native prairie wildlife. Three Pasture Loop (3.8 mile loop): This trail winds along existing ranch roads and a mowed path through upland prairie. From May through July, cattle graze on the hillsides and valleys. Red House Trail (6 mile loop): This hike passes through upland prairie and natural drainage areas. Several cultural features of the historic ranching era can be viewed along with wetland prairie flowers and a scenic grove of cottonwood trees. Click the icon to find a birding list for Chase County. Directions: From Emporia, travel U.S. 50 sixteen miles west to Strong City. Cottonwood Falls is one mile south on K-177 and the Tallgrass Prairie National Preserve is two miles north (on the west side of K-177). Open daily 9 to 4:30. Closed Thanksgiving, Christmas and New Year's Day. Ownership: The Nature Conservancy and the National Park Service cooperatively manage the Tallgrass Prairie National Preserve. Contact the Preserve at (620) 273-8494 if you have specific questions about use or management of this site. Click here to visit the web site of the Kansas Chapter of The Nature Conservancy. 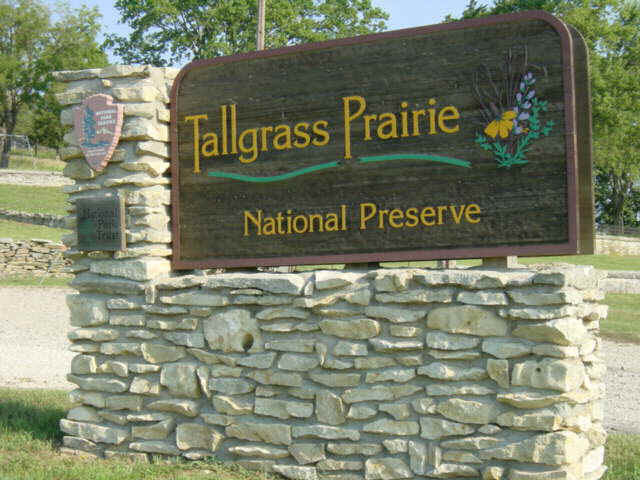 Click here to visit the National Park Service web site for the Tallgrass Preserve.